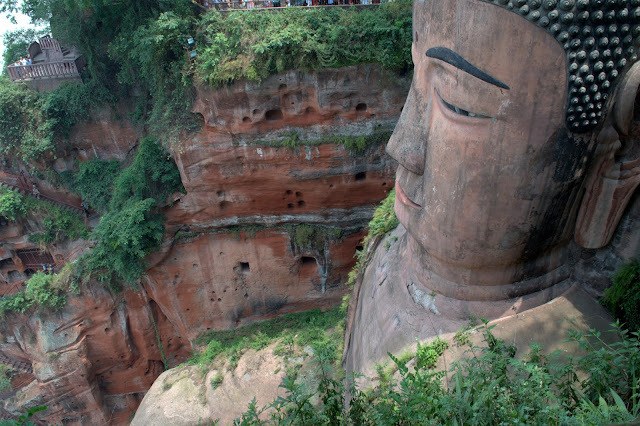 Meet the Dafo, or Great Buddha, who can be found in the town of Leshan, Sichuan Province, China. This photo, sadly, does not do him justice: he's giant. Sitting in his niche, he towers some 70 metres above the river, whose rapids he's said to tame. The Dafo, it turns out, is quite the tourist attraction. People come from all over China and beyond to pray at his feet. He's also on the UNESCO world heritage list, guaranteeing a steady enough stream of global travellers who come to gaze upon him. Sichuan Province is, among other things, famous for its tea houses, which occupy the place of the local pub here in the UK. 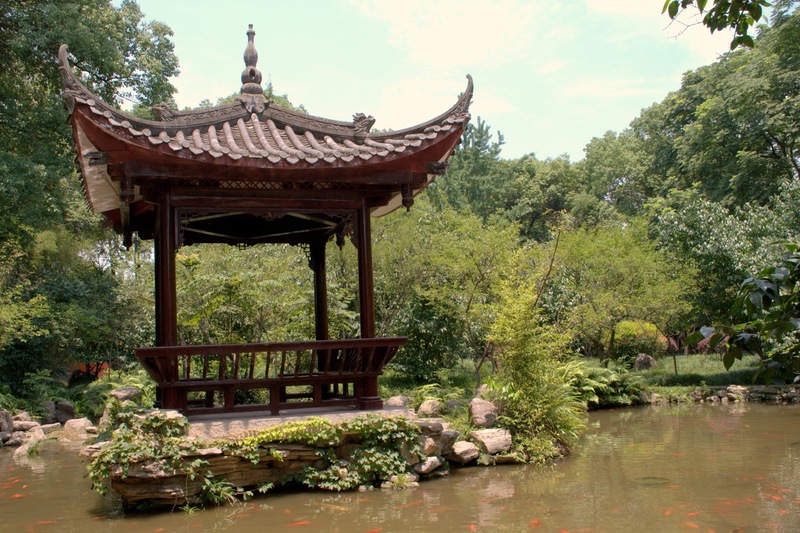 The Sichuanese go to the tea house to play cards or chess, meet friends, or simply to sit around doing nothing in particular. 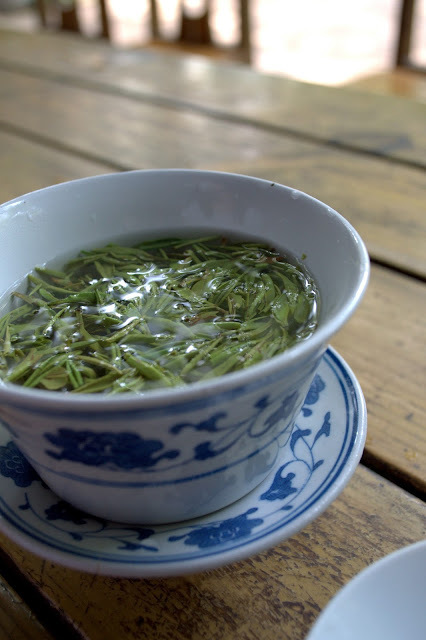 Since China is a country where there are relatively few places to relax in public, the Sichuan tea houses offer a place to put your feet up and get under the skin of the local culture a bit. As the summer is sweltering in Leshan, the tea houses in the ornamental gardens near the Buddha offer a welcome respite: cool leafy gardens with ornamental ponds provided the perfect backdrop to a cup of tea. 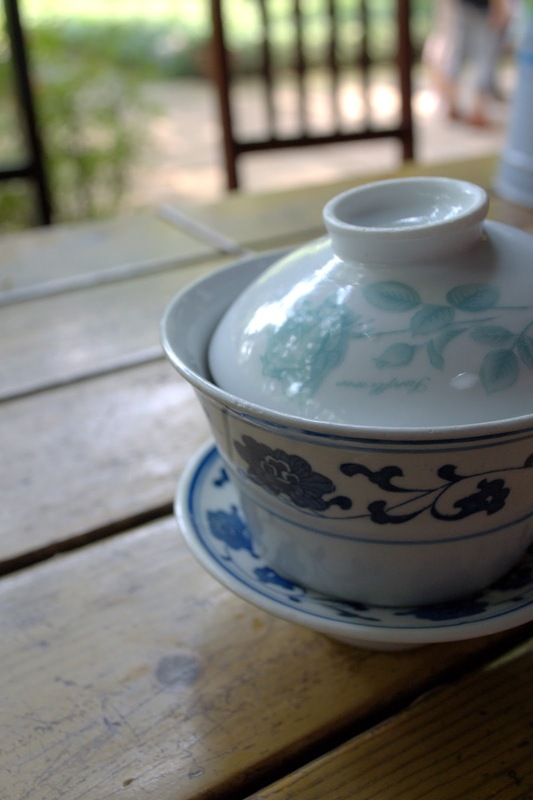 In this part of China, tea is served in a Gaiwan, a squat lidded tea cup and saucer. The lid is used to swirl the leaves around inside the cup and to keep the leaves out of your mouth as you drink. With a little practice, you can trap the leaves with one hand while drinking from the vessel (something A and C never quite managed to master!). Unlike in India, where black tea is the norm, the Chinese are large producers of green tea. Green tea in fact comes from the same plant as black teas such as Darjeeling, but the leaves aren't left to oxidise, leaving the tea with a somewhat grassier taste than one expects from black teas. China is also a country of tea connoisseurs: you can pay anything from a few pence to many hundreds of pounds for a bag of leaves. A and C didn't quite push the boat out to this extent while visiting the Dafo: the 'Buddha buds' tea we sampled was fairly inexpensive (given the touristy location) at RMB30, or about £3 a cup. While the portion looks small, the cup also comes with a vacuum flask of hot water, guaranteeing you get many many refills from the same set of leaves, making for a very refreshing way to spend an hour after paying our respects to the big man himself.